Toward the end of First Friday, the monthly Republican luncheon for Harrisonburg and Rockingham County, my former pastor rose from his chair and asked the audience how many of them feared radical Islam. Although I couldn’t see the entire group, I believe that everyone in attendance raised their hands…with the exception of me and the fellow sitting beside me. Now, that’s not to say that I am not at all concerned about terrorists who commit terrible acts on behalf of their religion, but I do not wake up every morning worried about what these radicals will do in our country nor am I concerned that some or all of my Muslim neighbors (supposedly about 7% of the Harrisonburg population) will rise up and begin killing or enslaving the rest of us. According the news that I’ve heard in the last several years, it seems more likely that local Muslim property will be vandalized by non-Muslims due to religious disagreements than the other way around. As we all know, as a result of the actions of some radical Muslims on 9/11, many Americans have been living in fear of this religion and those who practice it. Although there were some vague mentions of Islam before 9/11, I don’t recall it being particularly pronounced and when it was, it could be disregarded as religious bigotry. Don’t misunderstand what I am saying. Our government has both the right and responsibility to keep its people safe from all threats, including those posed by radical Islam. Any person, group, agency, or government who seeks to deprive any American citizen of his or her life, liberty, and/or property without the due process of law must be held to account. Have we become so hyper-sensitized to an over-imagined threat of radical Islam on American soil that we have forgotten that it has supposedly been the longstanding policy of conservatives to push back against growing government power? Yes, it is hypothetically possible that terrorists hiding in caves in the Middle East can deprive us of our lives, and I certainly don’t want that to happen to anyone, but it is also quite true that the legislators in Washington D.C. and our state capitols, not to mention black robed men and women in our court system, have been slowing eroding our liberties, taking more and more of our tax dollars, deciding what does and does not constitute as free speech, degrading our religion, imprisoning people for years without trial, and even depriving some people of their lives through the use of drones. Politicians are marching us toward a police state. Which of these two actions, in the grand scheme of our nation, poses the greater and more pressing danger to our well-being? As President George W. Bush stated on September 20th, 2001, “They [the terrorists] hate our freedoms: our freedom of religion, our freedom of speech, our freedom to vote and assemble and disagree with each other.” Well friends, if we have taken away our freedoms and replaced them with fear, then who can make the argument that the terrorists have not won? If the terrorists are as irrational and hate-filled as our leaders claim, why in the world would we ever want a citizenry or a government which emulates them? Yes, we must not allow radical Islam to succeed. Stand firm against evil! But, I urge you too to resist the call to surrender to fear! Tomorrow, the Rockingham County Fair begins. Although most people attend for the games, rides, crafts, or livestock, for me the highlight was the politics. No great surprise there, right? 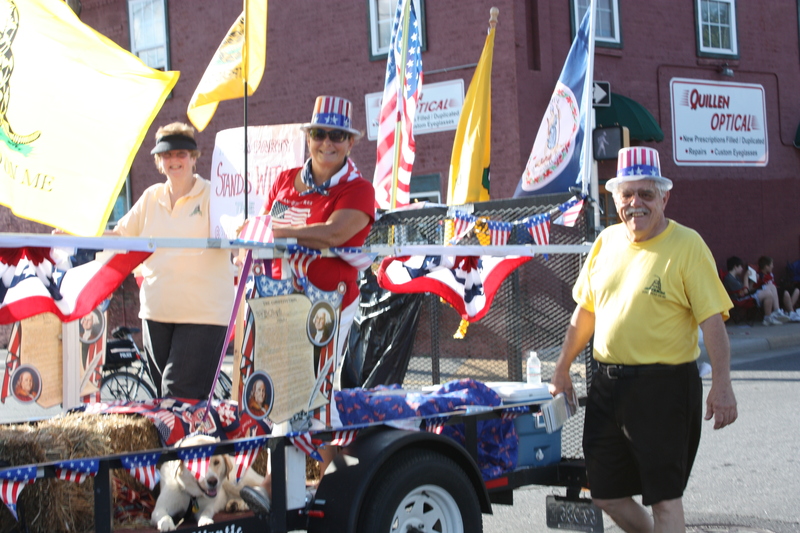 Ever since I began volunteering at the joint Harrisonburg/Rockingham County Republican Party booth at the age of fifteen, I always looked forward to the local fair with great anticipation. No doubt the fair was my favorite political event. The chance to spread your message to scores of those who walked past your table, the opportunity to speak with various politicians, the camaraderie, it was all great fun. 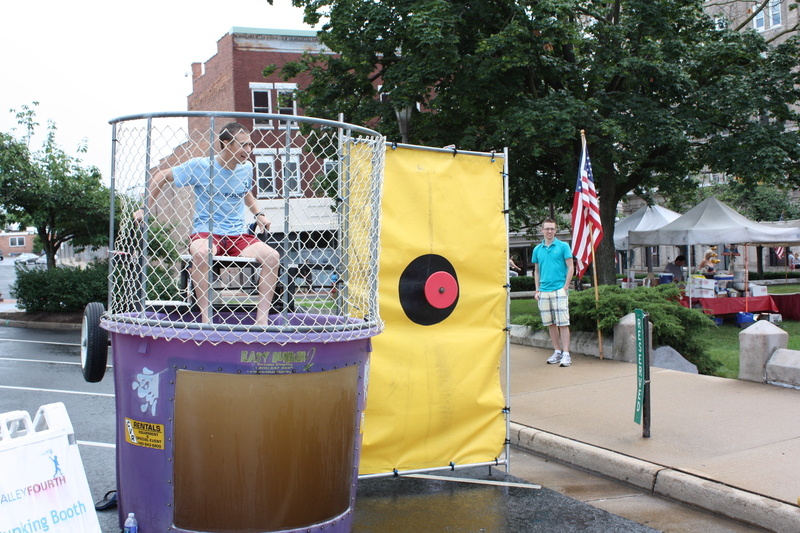 The image pictured here is from exactly four years ago, August 16th, 2011. That night, the Shenandoah Valley Young Republicans staffed the table. I cannot say that I remember too much from that evening, other than a visit from our local state senator, Mark Obenshain, who proudly wore a new set of boots that had been given to him by then Texas Governor Rick Perry after Senator Obenshain endorsed Perry’s bid to be the Republican nominee for president in 2012. The next day, I wrote about the experience. As for the folks pictured, going from left to right, Chad (Delegate Tony Wilt’s legislative assistant) and Savanna (Delegate Dickie Bell’s legislative assistant) are still active in politics and living in the area. They got married a few months after this photo was taken and recently celebrated the birth of their first child. I’d glad to say that they are still honorable folks. Jared (Senator Obenshain’s now former legislative assistant) moved up to D.C. to work for a lobbying firm after the 2014 elections. Patrick stuck around for a while, working on Senator Obenshain’s 2013 bid for attorney general until he supposedly stole a rival campaign’s cell phone, switched to the Stewart campaign for lieutenant governor, and allegedly tried to blackmail the Snyder campaign at that year’s state Republican convention. I have not heard about him since that time. And then, in a rather peculiar pose, you find yours truly, the only person not employed in politics when the photo was taken. At that time, I had no idea that the 2011 fair would be my last volunteering on behalf of the GOP. However, the next year when the YR party leadership under John (not pictured) began to attack me repeatedly, worked to discredit and diminish the 2012 Ron Paul campaign, and later tried to undermine my then employment with a group called We rVirginia, coupled with the fact that the party was running a candidate that year that embraced stances that sounded almost identical to the big government solutions advocated by his Democratic opponent, the joy that came from my yearly tradition of volunteering at the GOP table was gone. In 2013, I offered my services at the local Libertarian Party booth, but neither they nor I have been back to the fair since that time. 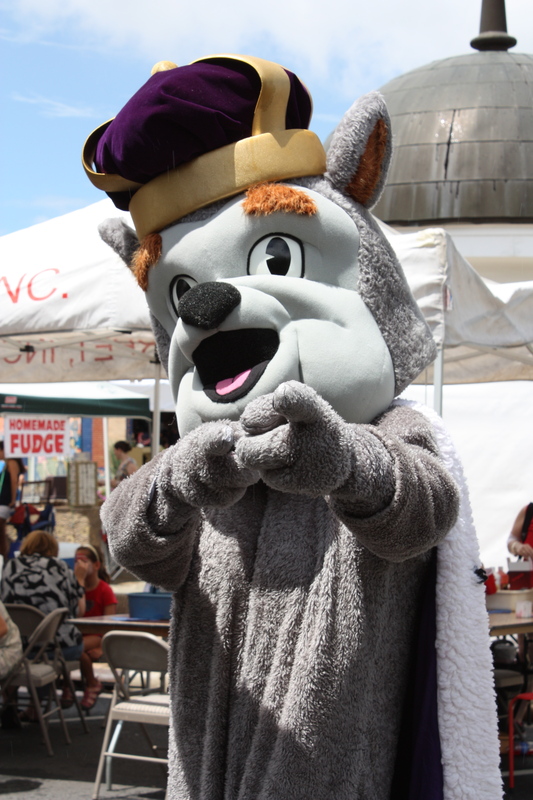 I hope that the magic isn’t completely lost, and that I’ll have the chance to work a political booth at the Rockingham County Fair at some point in the future. However, when that day comes, I assure you it will only be for a cause that appreciates its volunteers, one that has some semblance of honor, and one that I believe in. 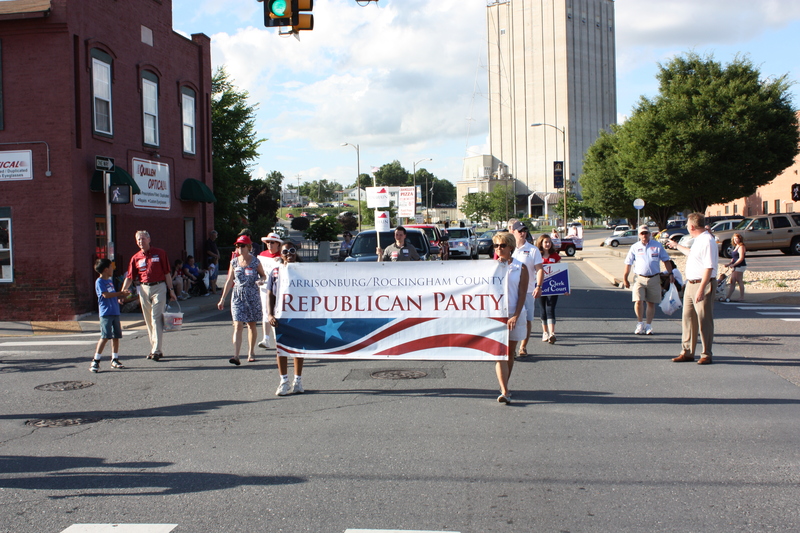 Yesterday, the Harrisonburg/Rockingham County Republican Party Headquarters celebrated its grand opening. Local State Senator Mark Obenshain acted as the master of ceremonies as neither the chairman of the Harrisonburg or Rockingham County GOP was in attendance. Oddly, none of the four delegates representing Harrisonburg or Rockingham County made an appearance. 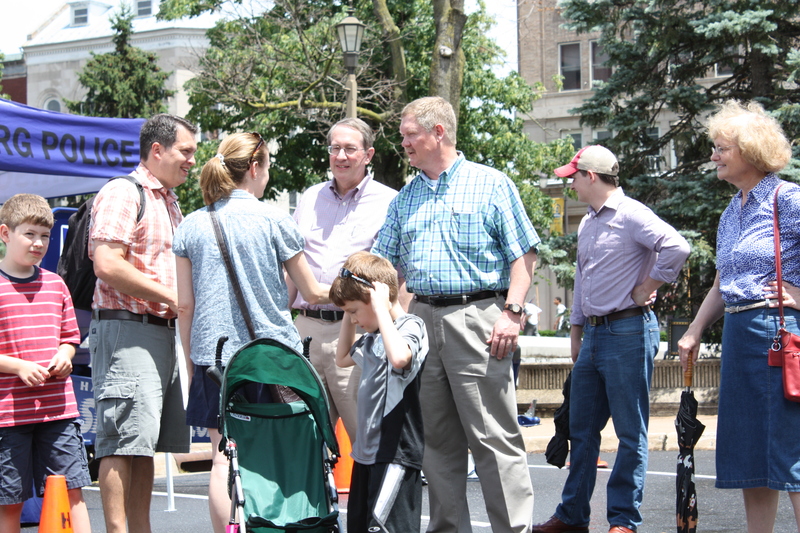 As a surprise guest, Representative Bob Goodlatte (VA-6) was on hand to speak. Also talking about their candidacy were D.D. Dawson and Ted Byrd, the two Republican city council candidates. One remark that the mayor made which stood out in my mind was that he declared that his opponents for city council were fairly new to the city. Although that statement is true of many of his opponents, it isn’t true for all as I have lived in the city of Harrisonburg almost my entire life. I was told that one of the organizers of the event wasn’t happy that I was in the crowd, given that I am running as an independent for city council. However, given my multitude of years of ties to the party and my fellow activists, I wouldn’t be deterred from being there. Not surprisingly, I wasn’t offered a speaking opportunity nor even officially acknowledged. Nevertheless, I did end up talking to a sizable chunk of the crowd one-on-one, not really discussing my campaign, but rather the current state of the GOP. Ms. Dawson pleasantly said hello as she often does and even Bob Goodlatte made it a point to shake my hand. The mayor also came up to me at one point to offer his greetings and mentioned that his statement about his opponents being from out of town didn’t apply to me. With that thought in mind, I thought it would have been prudent for him to use the phrase “almost all”. Then again, technically both Ms. Dawson and Mr. Byrd are opponents for each other given that they could siphon away votes from the other from voters who wish to support one Republican, not both. The Republican elected officials and candidates at the opening. Although I was appreciative of the fact that Rep. Bob Goodlatte mentioned what supposedly are the guiding principles of the GOP, such as limiting government and promoting liberty, I’m disappointed that such rhetoric isn’t much in vogue among Republican politicians. Worst yet, even fewer actually legislate with these thoughts in mind. Anyway, the local GOP headquarters is now open and should be a hub of activity for Republican activists making phone calls and knocking on doors between now and Election Day. Last night, I ventured over to the Harrisonburg Republican Party headquarters. Given how many hours I had volunteered to the party over the years, I thought I should pop my head in to see how they were doing. After all, I still have many friends who call the GOP their political home. While there, one activist suggested that I should return to the fold, that I ought to re-join the party that I had been an active part of from the ages of 15 to 33. I reminded her that I never left the party, it was the party which left me. However, her suggestion reminded me of an email that I saw many years ago. Here, let me tell you a story. On June 26th of 2009, the secretary of the Republican Party of Harrisonburg sent out the email pictured above, lambasting what the city committee considered to be “phoney Republicans”. In this case, they were a list of 8 Republicans who voted for Cap and Trade. What made this message significant was that it conveyed the idea that the Republican Party stood for a certain set of values; furthermore, those members of the party who opposed these core values weren’t really Republicans. These days, some might call these people RINOS (Republican In Name Only). To me, it emphasized the idea that Republicans needed to stand on principle, and that merely following party labels blindly could get us in all sorts of trouble. However, in the five years that have transpired since this email, unfortunately, it seems that the GOP has broken free of ideological mooring. As far as I have observed, the party doesn’t seem to be particularly concerned about issues anymore. In my opinion, what any party worth its salt should be doing is promoting principles as their most important goal…as well as helping elect politicians who embrace these values. Instead, it seems that the greatest (and perhaps only) priority of the GOP is supporting and electing Republicans…even if they embrace a philosophy abhorrent to the grassroots. For a few notable examples, consider senators like Lindsey Graham, John McCain, or the late Senator Arlen Specter. How Specter was seen as a good guy when he was a Republican and then a bad guy when he switched to the Democratic Party was beyond me. After all, his principles remained more or less constant. Today, where any politician stands on any specific issue is irrelevant. Only complete and unquestioned loyalty to the party is all that is valued anymore. I haven’t seen an email like this one from the city committee in a long time. I do have to wonder though…what if the current secretary of the Harrisonburg Republican Party were to send out a message like the one I have shared with you? Would the city committee even approve such as message any longer? Would the establishment insist that he be stripped of his position immediately? What do you think? Is there such a thing as “phoney Republicans” anymore? I think the answer is yes. However, over the last several years, the party has become so saturated with these so-called “phoney Republicans” that those who point out this truth are becoming the minority and thus silenced or ostracized. Don’t they know that they are sowing the seeds for their own demise? Has the party label expanded so much so that one doesn’t need to believe in supposedly core principles? Let me ask you this, besides Dave Brat, when was the last time that you heard a Virginia Republican stand up for or even mention the Republican Party Creed of Virginia? Outside of a handful of exceptions, have both the label and the party been rendered effectively worthless? In 2014, the Republican Party will select their nominee for U.S. Senate as well as their leaders for congressional chairman at conventions. Having served as a delegate to the 2008, 2009, and 2013 state conventions as well as the 2012 6th district convention, I’ve enjoyed voicing my opinion when it comes to selecting the most like-minded Republican candidates. However, I regret to say that I cannot participate this year. Based upon changes made in the Plan of the Republican Party of Virginia in 2013, the Harrisonburg Republican Party has adopted much stricter rules on who can represent the city at conventions. They require all delegates to sign a pledge declaring that they have not participated in the nomination contest of another party for the last five years and that each delegate promises to support every Republican nominee. Unfortunately, I could not sign such a document for a multitude of reasons. First, I voted in the 2013 Democratic primary for statewide office. Previously, I voted in the 2009, 2006, and 2004 Democratic primaries. The fact that I participated in these contests is not some great secret, I’m fairly certain the information is a matter of public record and I am not ashamed that I did so. In addition, I also attended the 2012 and 2013 Libertarian Party conventions although I did not cast a vote. I will make no apologies for any of these political actions. Although not a Democrat, I want the Democratic party to nominate the candidate most consistent with my values in much the same way that I want the Republicans and Libertarians to do likewise. Given that the Democratic primaries are funded by Virginia tax dollars, requiring people to not participate in a political process that they helped fund is nothing short of ludicrous. Second, I cannot in good faith pledge my loyalty to a candidate without knowing who he or she is or what he or she stands for. Wasn’t America founded upon the principles of political free will? And, if so, how could the Republican Party require its delegates to support its candidates blindly? It is a move bereft of both political and logical sense. Now, as you might imagine, this pledge is completely unenforceable. The party cannot legally require a person to support anyone. I must say that when I support a Republican candidate, it should be because she and I hold similar viewpoints, not simply due to a party label (which unfortunately these days can mean a whole multitude of things). For example, I gladly supported Republican Senator Mark Obenshain in 2013 because he was my preferred candidate in much the same way that I supported Libertarian Robert Sarvis. Even though the GOP cannot force anyone to abide by this pledge, I feel it is dishonorable for me to sign something I do not necessarily intend to uphold. Then again, I believe it is wrong of them to make such a request in the first place. Now, I should point out that not every local Republican Party has adopted such a binding restriction. 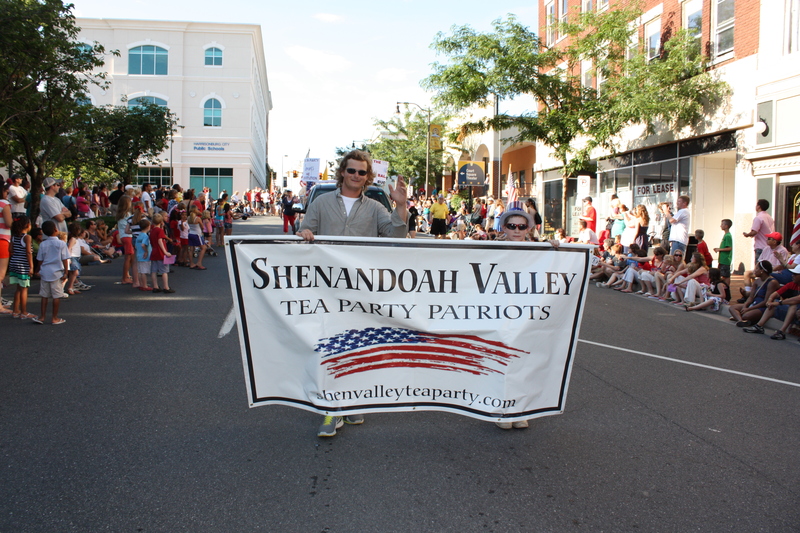 For example, the Waynesboro GOP simply states that “all Participants are required to be in accord with the principles of the Republican Party as expressed in the Creed of the Republican Party of Virginia.” This restriction makes sense and doesn’t deprive anyone of his or her political freedom or require a person to support candidates which he or she believes does not uphold his or her values. A little over a week ago, I wrote to the Harrisonburg GOP stating that, “in order to participate this year, as far as I can tell, I am faced with three options. Either I can lie to you and the Harrisonburg GOP, signing a pledge I cannot honorably uphold, I can abandon my principles in order to have a chance to voice my opinion, or I can ask the Harrisonburg GOP to change their requirements.” I could not choose the first two options and it seems the GOP declined to exercise the third. Although perhaps not widely known, since 2010 only one Republican candidate has won a contested election in the city of Harrisonburg when facing at least one Democratic opponent and no statewide office seeker has captured the majority of the city’s votes since 2009. Even when Democratic candidates lose elsewhere, they still win Harrisonburg. I find it incredibly sad that a party that I’ve devoted so much time to in the last nineteen years would surrender to tactics reminiscent of the Radical Republicans of the 1860s. Rather than encouraging voters to take an active role in deciding who the Republican nominee will be, some cities and counties, like Harrisonburg, have decided to circle the wagons and deny participation to activists who cannot swear complete and utter political fealty to the GOP. And what will the results of this restrictive action be? Will they somehow have the effect of increasing Republican victories? It seems doubtful. “E.W. 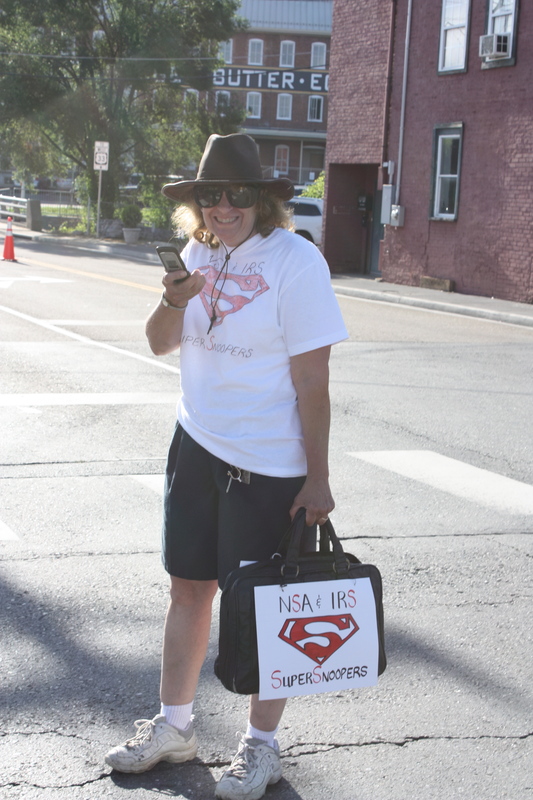 Jackson will be at the Rockingham County Courthouse on Court Square in Harrisonburg Wednesday October 30th at 4:30 P.M. E.W. Jackson will be laying out his agenda for his role as Lt. Governor if elected as a part of his Statewide tour to promote Conservative Governing principles. Update: Today’s emails indicate that this event has been cancelled. 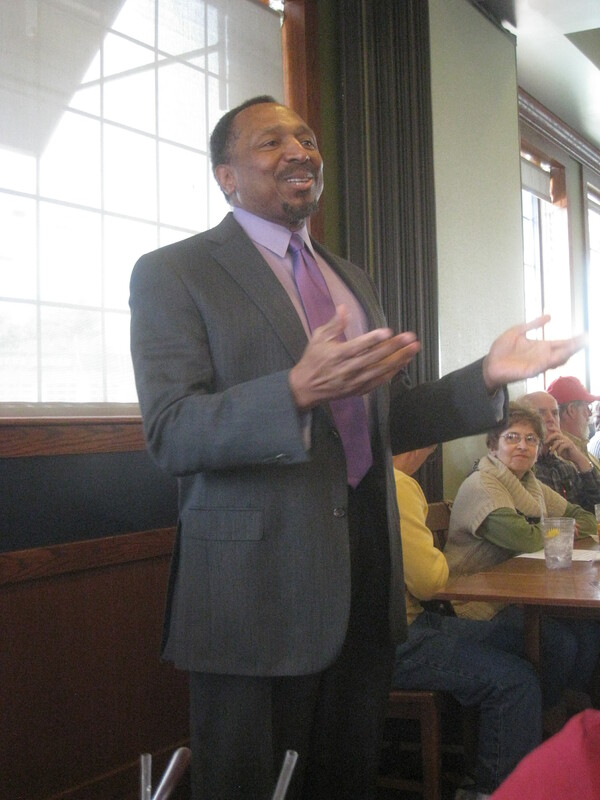 Today, the Harrisonburg and Rockingham County Republican Parties held their monthly gathering at the Woodgrill Buffet in Harrisonburg. The featured speaker at this event was Dr. Robert Roberts, a professor of political science at James Madison University. The topic of the day revolved around the upcoming 2013 statewide elections. Dr. Roberts painted a not particularly rosy picture for Republicans, pointing out the recent shake-up in the Cuccinelli campaign coupled with declining poll numbers for the attorney general, especially among women voters, does not bode well for the candidate. 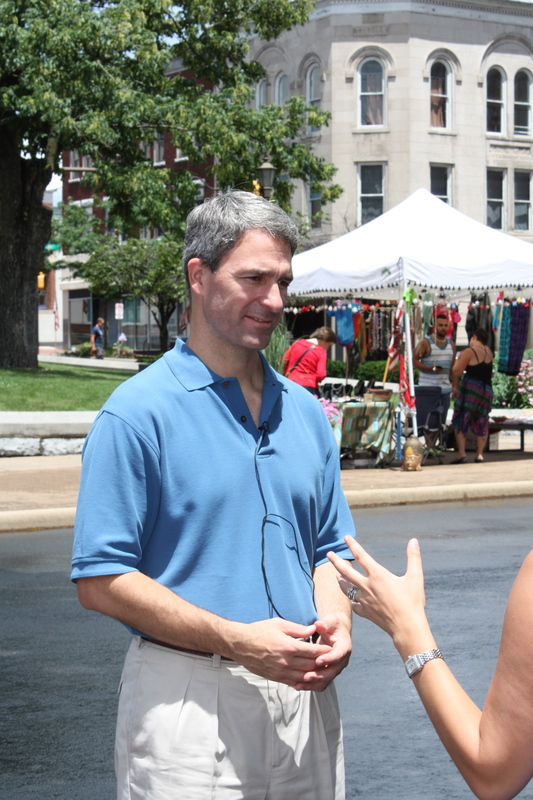 According to his historical data, public opinion typically shifts little between September and November and should this trend continue, the Cuccinelli camp is in serious trouble; Cuccinelli has not led a poll since mid-July. Someone in the crowd argued that Cuccinelli was heavily behind late in his 2009 run for attorney general and managed to overcome that deficit. However, the polls from that time suggest that speaker was in error, Cuccinelli seems to have led throughout that contest. Dr. Roberts also pointed out that the Cuccinelli campaign’s attempts to smear McAuliffe and make him appear unelectable have failed. Curiously, when he asked the Republican crowd what Cuccinelli’s first campaign issue was, no one in the group knew of his plan to cut the state income tax. As for the lieutenant governor, Dr. Roberts predicted that the average Virginia voter will find E.W. Jackson too extreme, based primarily upon his opposition to gay rights, especially gay marriage, and the issue of abortion. Moving to attorney general, Dr. Roberts offered some measure of hope to the Republicans, reminded them that Virginia has not elected a Democrat to that post since Mary Sue Terry in the late 80’s. However, even that race he thought was far from over for either candidate. Although certainly not as talked about, the latest PPP poll has that election within the margin of error. Given his predictions of a general Republican defeat, Dr. Roberts seemed like a rather curious choice for speaker at this event. Not surprisingly, his comments seemed to upset a goodly chunk of the audience. However, I found it interesting that his opinions closely mirror my own from last week, which suggested a result similar to 2001 where the only Republican victory was in the attorney general’s race. Will Dr. Roberts words come true? Today, the Harrisonburg and Rockingham County Republican Parties played host to both E.W. Jackson and Corey Stewart at their monthly First Friday gathering. These two men are vying, along with five other individuals, for the Republican nomination to be the next lieutenant governor of Virginia. As the title of this article states, this meeting saw a tremendously high turnout. Normally, the event takes up one of the back rooms at the Woodgrill Buffet in Harrisonburg, but today’s attendence was doubled, a number of activists not reached in at least a year’s time. 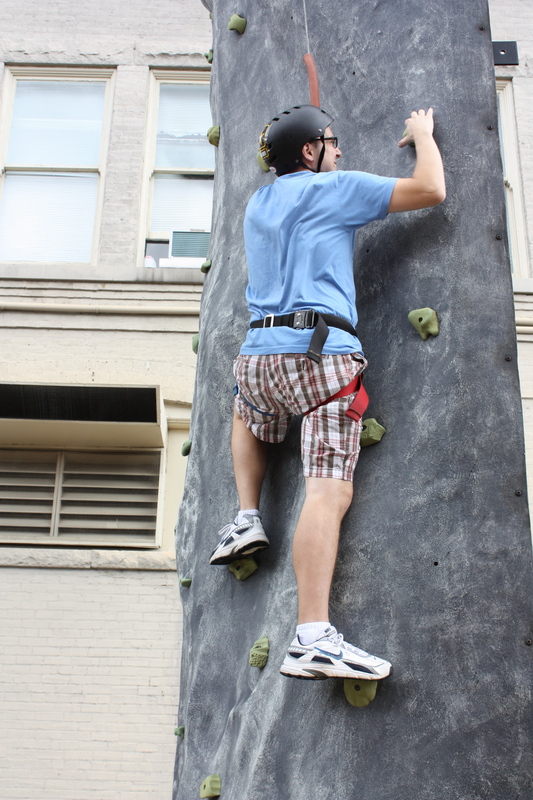 Besides Harrisonburg City and Rockingham County residents, there were also citizens from most of the neighboring and nearby cities and counties of Virginia including: Shenandoah, Page, Augusta, Staunton, Charlottesville, and Rockbridge. Both Stewart and Jackson gave impassioned speeches. 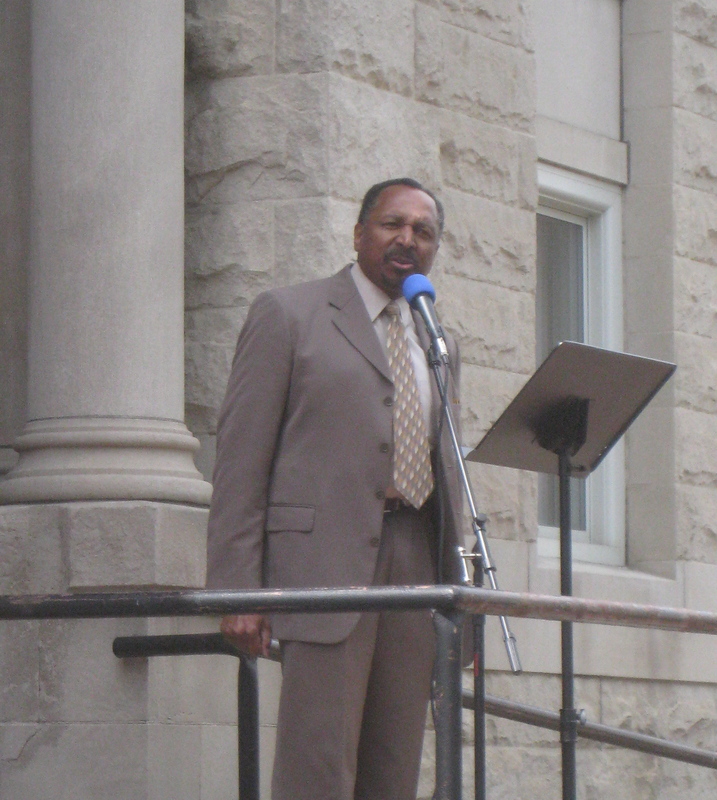 Jackson, arguably the strongest speaker of the seven GOP candidates, invoked the role of religion in the founding of the nation and highlighting his ability to reach out to minority communities, receiving a standing ovation from the crowd, while Stewart offered excellent statements as well, reminding the group of his successes as the chairman of the board of supervisors in Prince William County and also adding that it is not a proper role of government to be in the business of job creation. 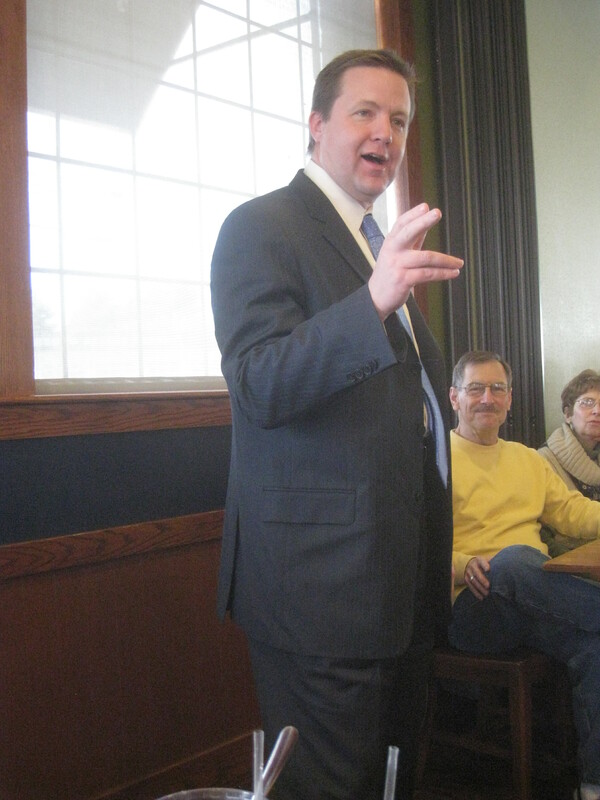 Upon the conclusion of First Friday, Corey Stewart offered what is likely to be a bit of chilling news to the Republican crowd stating his belief that Bill Bolling, the current Lieutenant Governor of Virginia who earlier dropped his run for the Republican nomination for governor, will announce his bid as either a third-party or an independent candidate for governor soon. Such a move on the part of Bolling would likely greatly hinder Ken Cuccinelli, the current Republican Party nominee. Jackson and Stewart seemed to gain a number of followers at this meeting today. However, as mentioned previously, given the fact that seven men and women are seeking the GOP nod, it is difficult to say which of the candidates currently enjoy the highest level of support. Remember, the May GOP convention will be here before we know it.